Macon County was created on Dec. 14, 1837, from Houston and Marion counties. The 91st county, it was named for the recently-deceased General Nathaniel Macon of North Carolina. The earliest inhabitants were the Cherokee, Muskogee (who later became part of the Creek Nation) and Uchee Indians. Gen. Macon served in the U.S. Congress for 37 years and ran for U.S. vice president. The city of Macon, about 50 miles north of Macon County, was also named for him, but is actually the seat of Bibb County. It is said his name was chosen because many of the settlers of this area came from North Carolina. The first county seat was actually not chosen until 1838 when the county's inferior court selected the Lanier community. The Georgia General Assembly made it official on December 29 of that year and incorporated Lanier as a town. The Central of Georgia Railroad was built through Oglethorpe in the 1850s, and the legislature called for referendums on moving the seat to Oglethorpe in 1854 and 1856. Little is known about the first vote, but the second resulted in the change to the new county seat the following year. The Macon County Courthouse in Oglethorpe was built in 1894 and is an example of the Romanesque Revival style. It is the county's third courthouse, and the second built in Oglethorpe. The first white inhabitants of the area were Indian traders. In the late 18th century British colonist Timothy Barnard became the Principal Temporary Agent for Indian Affairs south of the Ohio River and settled on the Flint River in what is now Macon County. Barnard married an Uchee Indian, and his settlement was a popular trading post until his death in 1820. During the Civil War (1861-65), the most notorious Confederate prisoner-of-war camp, Andersonville Prison, was located in Macon County, about nine miles south of Oglethorpe. Designed to hold 10,000 Union prisoners, Andersonville housed 33,000 at one point, 13,000 of whom died of hunger and disease. There is also an active Mennonite community in the county. A community of Beachy Amish Mennonites from Virginia formed a settlement here in 1953, which thrives today near Montezuma. Deriving their name from Moses M. Beachy, the sect's first bishop, Beachy Amish Mennonites accept some technological conveniences that Old Order Amish prohibit, including automobiles and electricity. However, they still strive to maintain a separatist posture in relation to American society, rejecting such modern forms of entertainment as movies and television. As of 2007 the community in Montezuma supported three churches and three Mennonite schools. The White House Farm Bed and Breakfast and the Deitsch Haus restaurant, both operated by the Yoder family in Montezuma, offer visitors a glimpse of life in a Mennonite community. Macon County has been the home of several famous Georgians. Writers John Donald Wade, a member of the Vanderbilt Agrarian movement, and Adrienne Bond, a vice president of Mercer University, lived here, as did Samuel Henry Rumph, whose work led to Georgia's nickname as the Peach State. 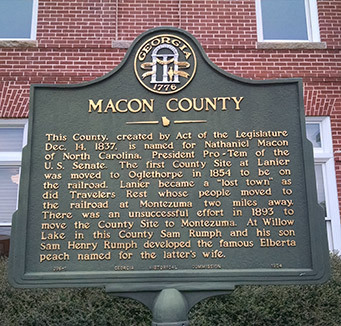 In fact, the history of the famous Georgia Peach is closely intertwined with the history of Macon County. A Marshallville resident, Rumph pioneered the cultivation of peaches on his family's plantation near Marshallville and developed the famous Elberta peach which was shipped to northern markers for the first time in 1875. The peach was named for his wife. In the early 1800s, Macon County had earned its reputation as a fruit center, but the innovations of Samuel Rumph gave the county a presence in peach production that stands today. Samuel Rumph’s contribution was not the only one to come from the Rumph family. An uncle, Lewis A. Rumph, introduced the Belle of Georgia, which he named for Mrs. Belle Hall, mother of Mrs. J.N. Neel of Macon. Both the Elberta and the Georgia Belle are reported as coming from seeds of Chinese Cling. In 1886, another Marshallville resident, Eugene Hiley, made a contribution to the growth of the peach industry by introducing the Hiley Belle. The Elberta, Georgia Belle and Hiley Belle were heavily planted throughout the middle Georgia region for several decades. An interesting twist in the history of Macon County is the story of Col. George W. Fish and his haunted house. Col. Fish arrived in Oglethorpe from Pulaski County in 1852 and built a home modeled after those of wealthy British planters in the West Indies. He was murdered at the Macon County Courthouse, where he spent much of his time, in 1871, and his ghost took up residency in his beautiful home. The house was moved to Americus in 1969 and the ghost followed the house to its new location. The new owner of the home said he was "sleeping in his chair in front of the fireplace when a lean, dark-haired man in Victorian clothing suddenly materialized directly in front of him." The ghost told the new owner he was not happy that the home bad been moved to Americus, but that he was pleased with the restoration work and was at peace.